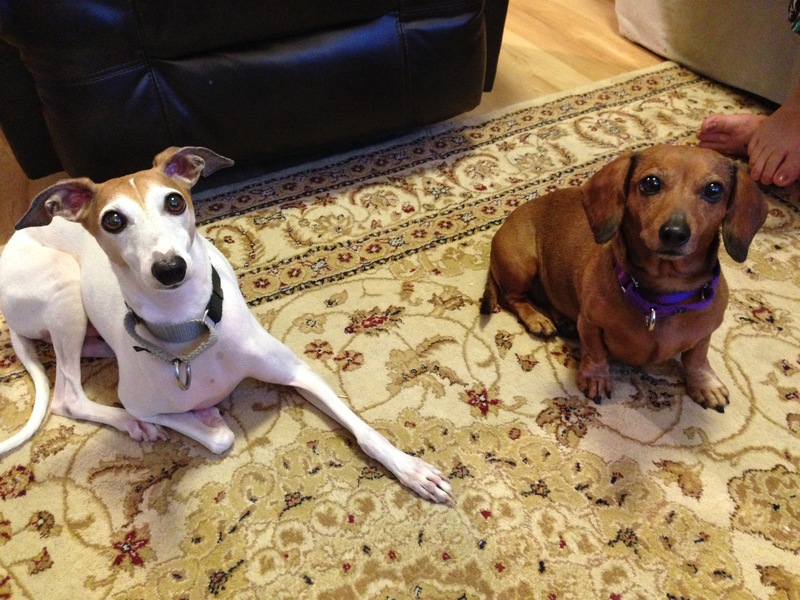 For this session I worked with Italian Greyhound Linus (left) and a female mini Dachshund named Jack. Their guardians asked me to help put a stop to their barking, getting overexcited and jumping up up on people who visit. I started out the session by investigating to learn what rules and structure the guardians had in place for the dogs. As is often the case for my clients, the dogs really didn’t have any. But rules and structure are extremely important when you have multiple dogs living together. If they don’t have any rules, the dogs think they must be the one making the rules. So you have multiple dogs thinking they are in charge. This often leads to conflicts between the dogs. It also results in dogs who don’t hold much respect for the human’s authority. I suggested a few simple rules and boundaries to help start to change the leader follow dynamic such as having to wait for things and keeping the dogs off of the furniture. For dogs, the higher they sit, the more rank or authority they have. BY not allowing them to sit at the same level as a human, we can help them see a literal distinction between man and dog. Next I went over some nonverbal ways of communicating with the dogs as well as how to correct them if they forgot to follow any of the new rules or boundaries. Dogs give an take territory, so one of the things I showed the guardians was how to use movement and body position to send a message rather than yelling at them. 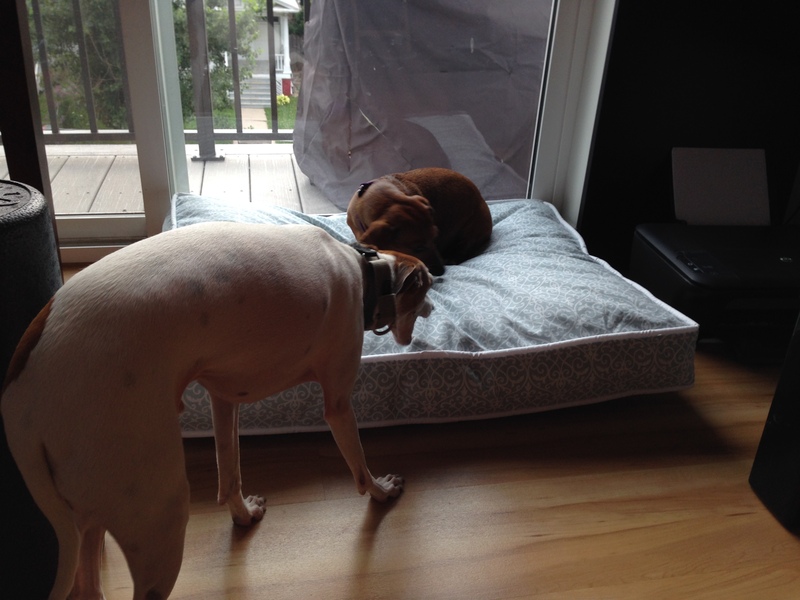 One of the dog’s guardians mentioned to me that they had a dog bed that the dogs never use. This is likely a result of the dogs being allowed on the furniture. Sitting on the floor doesnt have the same status that the dogs are afforded when they sit at a higher level. To help condition the dogs to start using this dog bed I had her place it on the floor then tossed a high-value meet treat onto it. And as soon as Jack saw the treat waiting for her, she moseyed on over to the dog bed and climbed on top of it to retrieve her reward. As soon as the treat touched her lips I started repeating a command word of “bed.” By repeating the command word while the dog eats the treat while on the bed, we can connect the command word with the location. I tossed a few more treats onto the dog bed this way, one at a time. After I tossed the third treat, Linus came over to see what he was missing out on. I went over a few different ways to use treats to get the dogs onto this bed. If the guardians keep at it for a few days and block the dogs from getting on the furniture, they should start using the dog bed on their own. With enough repetition of hearing the command word when the treat touches their lips. they will start going to their bed on command. Because Jack got excited or territorial when out on walks, I asked their guardian to go and get their leashes. 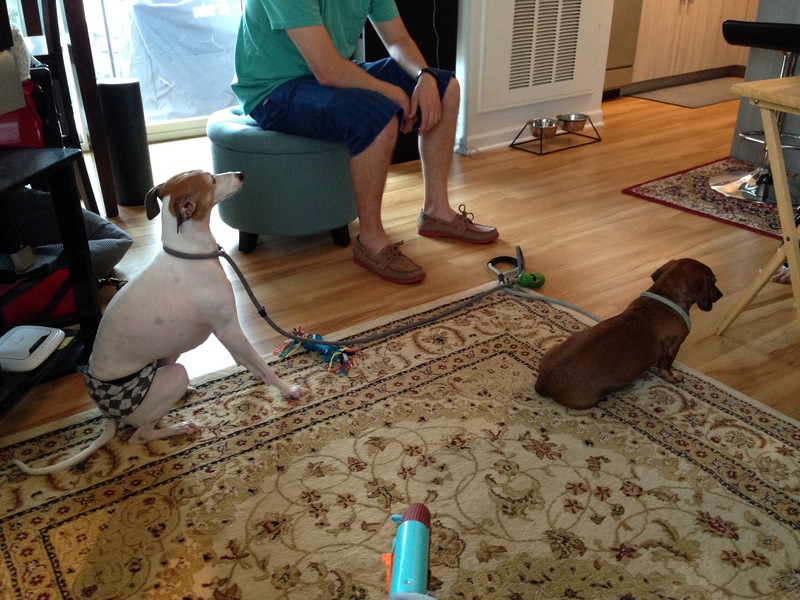 I wanted to observe their demeanor and energy when they realized he was getting the tools for a walk. 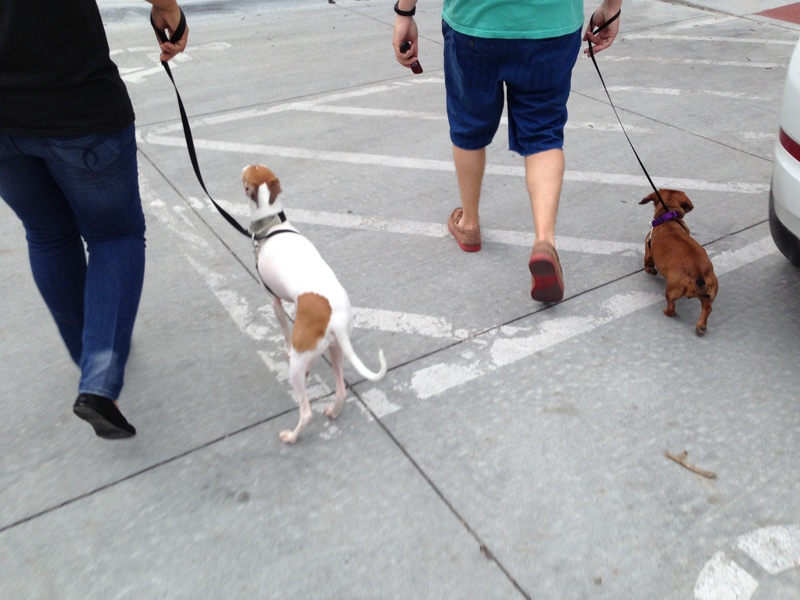 Just as I suspected, both dogs started to get excited when he got to where they kept the leashes. As soon as the excitement level went up, I had him put the leashes back and walk away. Only after the dog had returned to a completely calm and balanced frame of mind did he try again. Linus wasn’t as excited so his guardian was able to get the leash on by the second attempt. But when he attempted to put the leash on Jack, she started to bounce around a bit so he dropped the leash on the floor then sat down to wait until she was calm before trying again. Their guardian said he usually had to chase and wrestle the dogs to get the leashes on as they were so amped up once he got the leashes out. But by taking the time and pausing as soon as they started to get excited, he was able to get the leashes on the dogs easily and keep the dogs calm after they were leashed up. Because we took the time, the dogs were much easier to walk; not pulling and no reaction to dogs that we encountered on the walk. I had fitted Jack up with a Martingale collar and it gave her guardians much more control which made them feel more at ease. A dog’s handler can have a big impact on a dog and how it reacts to various stimuli. If the handler is calm and doesn’t react, dogs will often follow their lead. That was clearly the case here as Jack was walking in a help position with a loose leash within moments of starting the walk. After returning to the apartment, I showed their guardians a technique to help them claim the area around the door to prevent the dogs from charging at and jumping on guests. I had my apprentice Tara step outside and play the part of a visitor. As soon as the dogs heard the knocking, they rushed to the door area. I walked to the area calmly and used movement and my presence to move the dogs 11 feet way from the door. Only after I had both dogs beyond this 11 foot boundary did I open the door. This distance helps the dogs be less intense in their reaction to the knocking which helps keep them from getting over excited. When one of the dog’s guardians mentioned he couldn’t believe that they weren’t barking or charging the door, I knew I we were making great progress. After demonstrating the technique myself. I had Tara step out again so the dog’s guardian could practice answering the door himself. This time the dogs didn’t bark when the knocking started and Linus didn’t even go over to the door area at all. Jack started towards the front door but stopped as soon as his guardian made a sound to disagree. By the time he got to the front door, Jack was a good 15 feet away and showed no signs of rushing the door. The last thing we went over was a more structured feeding ritual. Feeding time can give a dog’s guardian a lot of rank or status if done the right way. Unfortunately the dog’s guardians had been free feeding the dogs using a single food bowl. I noticed this was a problem at the start of the session as Jack was eating from the bowl and Linus was standing over her in a dominant position. Being this close and standing over a dog who is eating is rude at best and a challenge to most dogs. I had their guardian get out a second bowl then start to add food to both dishes. As soon as the dogs heard the sound of the food bag, they got up and came over as they usually did. But this time I had their guardian block them and institute a seven foot boundary around the dishes. Each time one of the dogs tried to move towards their bowls, the guardian used movement to tell the dog it needed to stay away. 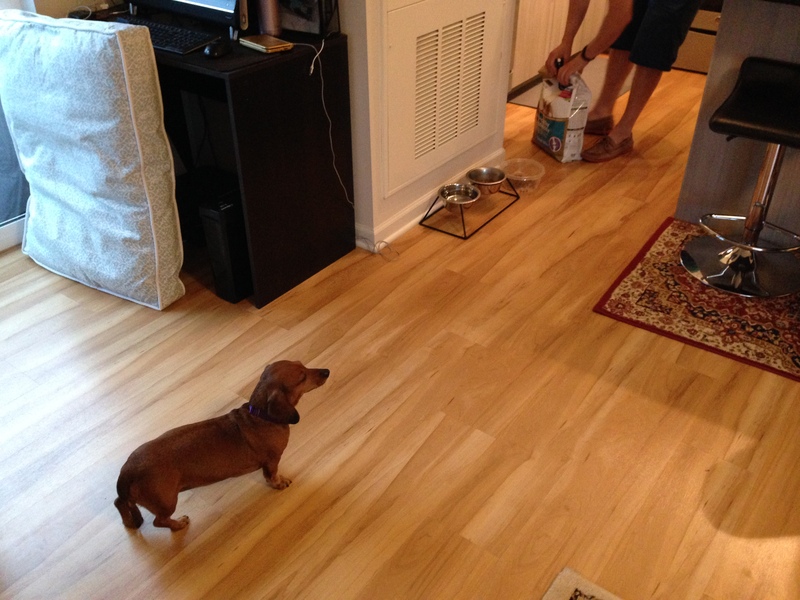 It only took two corrections before Linus left the area altogether and Jack stood behind the boundary on her own as her guardian added the food to their bowls. By having dominion over the food and controlling when the dogs eat, their guardians can tap into a primally important aspect of canine sociology that will fundamentally change how the dogs see themselves in conjunction to their guardians. By the time we finished the session, the dogs were calm, obedient and even respecting the new rules on their own. The more that their guardians assume a leadership role through their actions and movement, the more the dogs will defer to them when led or corrected. With a few weeks of this new structured life, the dogs unwanted behaviors and actions should diminish and eventually stop completely.